Textile Exchange (TE) is a nonprofit, membership-based organization that inspires and equips people to accelerate sustainable practices in the textile value chain. We focus on minimizing the harmful impacts of the global textile industry and maximizing its positive effects by building capacity, interpreting and disseminating information, and sharing best practices across the entire value chain – from farmers and raw material providers to brands, retailers, and consumers. The answer to who we are begins with who we’ve been. A place and space where organic farmers had a voice, suppliers could share best practices, and competing brands could collaborate. The market asked for more. An organization positioned at the juncture of material solutions, resources, and environmental impacts to help make sense of the confusing world of sustainable textiles. As a global, nonprofit, membership organization, we help accelerate sustainable practices in the textile value chain. We also work closely with organic cotton producer groups to help build supply and improve value chain relations. Because it impacts people. Lots and lots of people. 9 billion by 2050. Because there are serious issues of waste, water, energy, toxics, climate and biodiversity. There is an intimate relationship between poverty and agriculture. Three quarters of the 1.2 billion people who live on less than a dollar a day, work and live in rural areas. Repeated studies have shown that agriculture is key in the fight against poverty. Organic belongs here. 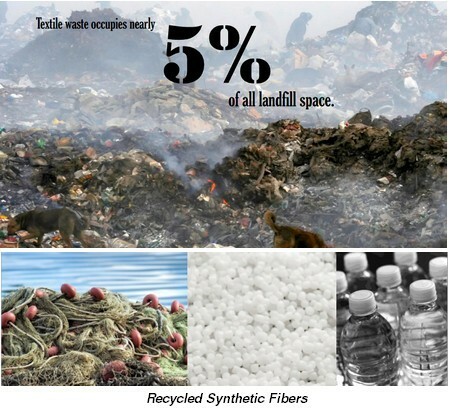 Textile waste occupies nearly 5% of all landfill space. It takes 2700 litres of fresh water to make 1 cotton t-shirt. In 2009, the world used 3 trillion gallons of fresh water to produce 60 billion kilograms of fabric. The average US citizen throws away 30 kilograms of clothing every year. One trillion kilowatt hours used every year by the global textile industry which is equivalent to 10% of total global carbon impact. According to the World Bank : 20% of industrial fresh water pollution comes from textile treatment and dyeing. We envision a global textile industry that restores the environment and enhances lives. We inspire and equip people to accelerate sustainable practices in the textile value chain. Polyamide accounts for about 10% of all man-made fibers. 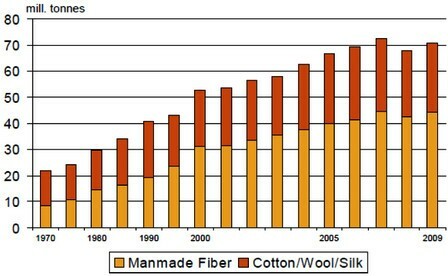 Polyester accounts for more than 70% of all man-made fibers. Synthetic fibers are made from petroleum based chemicals. The raw material is crude oil; the same resource as gasoline. The production of synthetic fibers is fully relying on a non renewable and hence limited resource which we need in many ways in our everyday life. 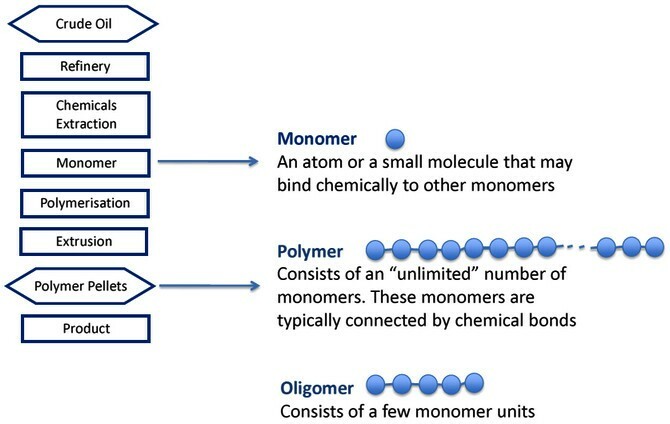 Going through different processes, including refining oil, breaking it into chemicals followed by a polymerization process, polymers are produced, extruded and then spun into fibers. These processes are energy intensive. 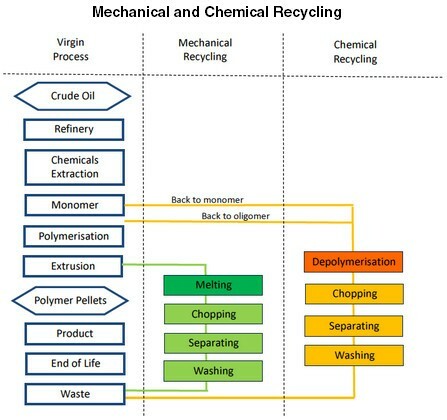 Now let’s try to understand the process of recycling. A recycled content claim may be made only for materials that have been recovered or otherwise diverted from the solid waste stream, either during the manufacturing process (pre-consumer), or after consumer use (post-consumer). Any express or implied claim about the specific pre-consumer or post-consumer content of a product or package must be substantiated. 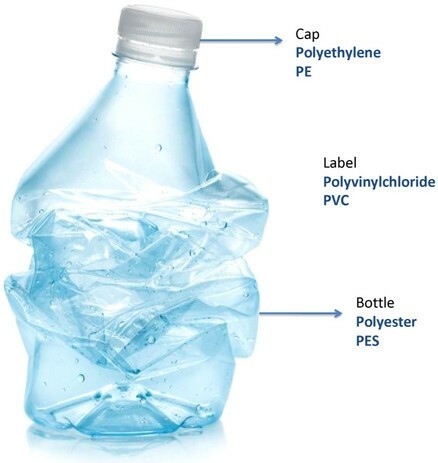 For products that are only partially made of recycled material the percentage of recycled content in the product must be stated clearly to avoid consumer deception about the amount of recycled content in the finished product. A manufacturer routinely collects spilled raw material and scraps left over from the original manufacturing process. After a minimal amount of reprocessing, the manufacturer combines the spills and scraps with virgin material for use in further production of the same product. 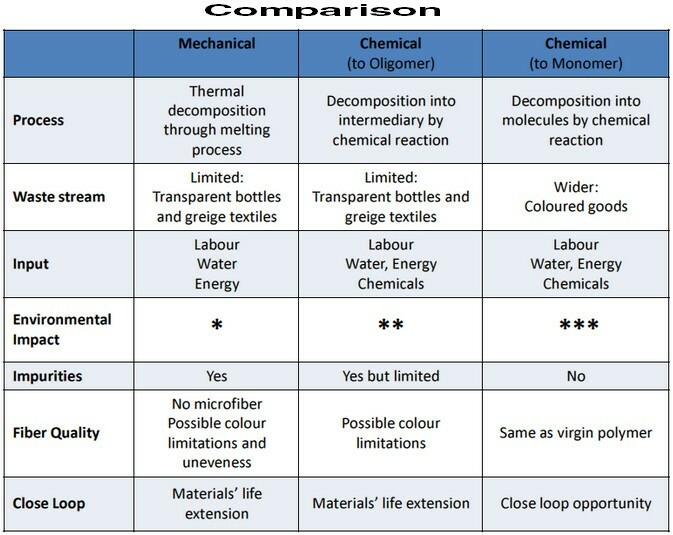 A claim that the product contains recycled material is misleading since the spills and scraps are normally reused by industry within the original manufacturing process, and would not normally have entered the waste stream. A manufacturer purchases material from a firm that collects discarded material. All of the material was diverted from the solid waste stream and is not normally reused by industry within the original manufacturing process. The manufacturer includes the weight of this material in its calculations of the recycled content of its products. A claim of recycled content based on this calculation is not misleading as it would have entered the waste stream if not reused. 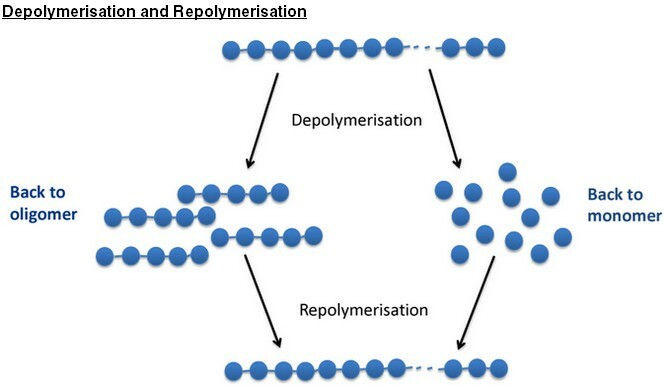 for polyamide: garments, fishing nets. Often combined in differing amounts and possibly including some virgin polymer. Recycling conserves non renewable resources by replacing the need for primary extraction. It is beneficial both from an energy use and green house gas emissions perspective. Recycling should always come after reducing and reusing following waste hierarchy principles. It is important to ensure integrity of the claims. Developing innovative garment to garment solutions.